Justin Levene, a paraplegic man, is suing Luton Airport after his self-propelling wheelchair was left behind on a flight and he was not provided with other means to independently move throughout the airport. At the age of 20, Levene underwent surgery for a herniated disc, but something went wrong on the operating table, and he was paralyzed from the waist down. Since then, Levene has worked hard to be independent and has been successful as an international wheelchair athlete and trainer and mentor to athletes with disabilities. When he arrived in London’s Luton Airport in August 2017 to find that his self-propelling wheelchair had been left behind, he asked staff for a self-propelling wheelchair or motorized buggy, but the airport did not have either. Airport staff offered to push him through the terminal in a high-backed wheelchair, but Levene rejected the offer finding it degrading to his independence. Levene told the BBC: "I've worked very hard for a number of years to try and maintain all of my independence." Without his wheelchair, he says his self-sufficiency and independence "was no longer there." "And to be in one of the chairs they were offering would make me feel humiliated and degraded. They insisted in trying to strap me down in it," he said. "I wouldn't have been able to adjust myself, and would have been at risk of getting a pressure sore." Without a motorized buggy or self-propelling wheelchair, Levene opted to drag himself on the floor throughout the terminal. Photos show that Levene eventually hauled himself on a baggage trolley and pushed himself to a taxi. While Levene understands that mistakes can happen like leaving behind his own wheelchair, he expected Luton to provide him with the proper equipment. "Every single airport I've been to, no matter where it is, no matter how small the airport may have been, there has always been some form of equipment, whether it has been a self-propelled wheelchair or a buggy," he says. 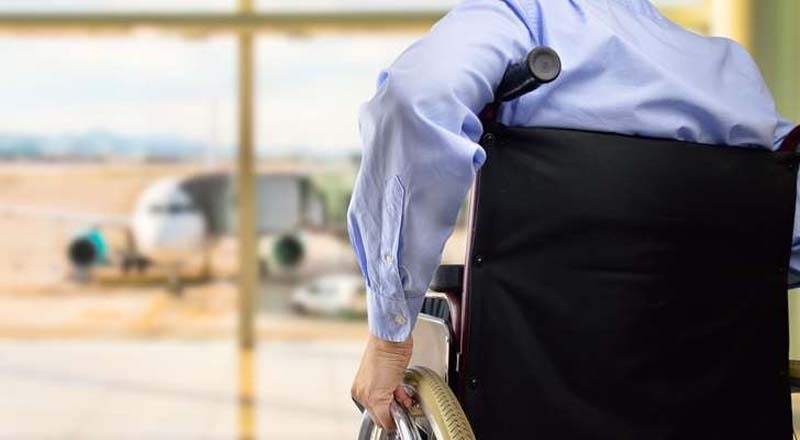 Levene’s suit against Luton Airport claims that they did not provide “adequate disability equality and awareness training to those responsible for providing mobility assistance,” according to BBC News. In a statement, the airport said: "On discovering that Mr. Levene's flight had arrived without his wheelchair, our teams worked hard to find a solution, offering Mr. Levene an assisted wheelchair as a temporary replacement." "Mr. Levene declined all offers of help as he deemed them unacceptable. While we apologize if Mr. Levene was dissatisfied with the service he received, we are satisfied that our agents and staff did all they could in difficult circumstances." For Levene, an apology isn’t enough. "There should be appropriate equipment in every single airport,” he said. "If something does happen, no one should be put in the position that they are forced to crawl through the airport or drag themselves along the floor." "And there should be some form of equipment to move themselves independently. Someone whose chair is their legs shouldn't be forced to be reliant on others for help."